Your digital properties—websites, mobile apps and more—are central to your business. And your customers spend an incredible 5.6 hours per day with digital media. With all of that data to collect—and the technology to pull reports instantly—marketers like you are now able to understand their customers like never before. But is your web analytics implementation bulletproof? 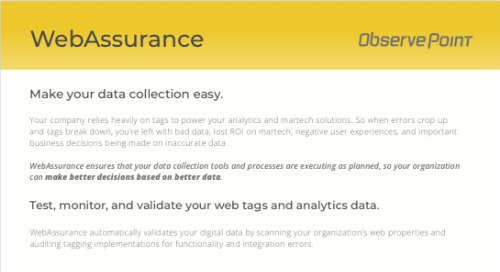 To see specific insights pointing the way toward actionable best practices for your analytics implementation (plus a Bonus Tip), fill out the form and download your complimentary eBook now.